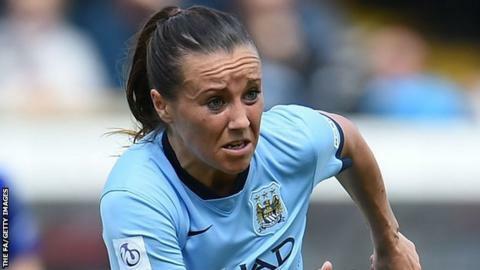 Manchester City striker Natasha Harding says Wales women's Euro 2017 qualifier against Kazakhstan is a must-win game. Wales host Kazakhstan in Haverfordwest on Thursday having lost their opening two qualifiers. Jayne Ludlow's side lost 3-0 away to Austria in their Group 8 opener before a 4-0 defeat by Norway in October. "We can't think of anything else. We can't think to draw or lose," Harding said. Wales are bottom of the group after two defeats and are away to Israel on 1 December following their home game against Kazakhstan. Former Bristol Academy player Harding, 26, says Wales remain positive despite losing their opening two games in the group. "I think everyone's pretty confident going into this game that we are capable of competing with the top teams," Harding added. "This is one team we need to perform well against and beat and that will help us move on to Israel." Wales squad: Alice Evans (Sinnai Calcio), Jo Price (unattached), Loren Dykes (Bristol WFC), Sophie Ingle (Bristol WFC), Angharad James (Bristol WFC), Laura-May Walkley (Reading Ladies), Rachel Rowe (Reading Ladies), Nia Jones (Reading Ladies), Helen Ward (Reading Ladies), Melissa Fletcher (Reading Ladies), Rhiannon Roberts (Doncaster Rovers Belles), Hayley Ladd (Bristol WFC), Natasha Harding (Manchester City Women), Charlie Estcourt (Reading Ladies), Helen Bleazard (Yeovil Town Ladies), Jess Fishlock (Seattle Reign), Kayleigh Green (Cardiff City Ladies), Chloe Lloyd (Cardiff City Ladies), Nadia Lawrence (Bristol WFC), Alys Hinchcliffe (Yeovil Town Ladies), Shaunna Jenkins (Cwmbran Celtic), Amelia Ritchie (Brighton Ladies), Chloe Chivers (Cwmbran Celtic).